If you're travelling first class or business, a soon-to-be-implemented project will allow you to go straight to boarding gate without undergoing immigration check at Dubai airports. The ongoing Gitex Technology Week revealed that two future projects and one currently being implemented will make travelling smooth and smart at Dubai airports. There is another future project that will allow passengers to finish immigration check under 15 seconds by walking through a 'smart tunnel' without the need of presenting their passport. And a system currently implemented on a limited basis allows travellers to fly even without their passports or boarding pass as long as they have their smartphone. Gitex Technology Week in Dubai on Monday, Capt Amer Rashed Almheiri, general directorate of residency and foreign affairs (GDRFA) director of smart application department, said as part of the Dubai 10X Initiative, a futuristic project will allow a traveller to ride an e-car, equipped with immigration checks. "There is a camera inside the car that uses facial recognition, which is connected to smart immigration gates at the check-in areas. "All information are captured, including passport details and the boarding pass will be sent to the counter. The traveller will not have to go through the immigration and can go straight to the lounge and the boarding gate," he said. "What is more amazing is that there is a weighing scale and scanner at the boot of the car so the baggage will be weighed, scanned for any prohibited materials and after passing the scanning will go straight to the cargo area of the plane," Almheiri added. The GDRFA is working with Tesla for the project. Simply put, the car will collect the passengers' information, issue the boarding pass on smartphone, weigh the luggage and the traveller will have a smooth travel on the way to the airport. For regular travellers, a future smart gate will also allow them to forego the smart immigration gates. The smart tunnel system uses facial and Iris recognition technology. All the passenger has to do is to stand in front of the tunnel then walk through it for facial recognition and body scanning and exit the smart tunnel in a few seconds without the need for passport control or immigration check at the terminal. "At present, e-gates at the Dubai airport terminals still require an Emirates ID to access the system but for smart gates, the passenger only has to scan the barcode on the smart phones to open the smart gate. Then the passenger will scan his/her fingerprint and the entire process is finished in under 15 seconds," Almheiri said. Emiratis, GCC citizens and the UAE residents who use the smart gates will no longer have to queue at the boarding gates. "Once they've cleared the immigration check, they can go straight to the boarding gates," he added. A current project being implemented by the GDRFA on a limited basis is the next generation smart gate, which will gradually replace the existing e-gates and need for physical identification documents for travellers going in and out of Dubai. Capt Amer Rashed Almheiri said the departure and arrival check will be done in less than 15 seconds by using the Smart UAE Wallet, an app which contains all the passport details and smart gate card data of the traveller. The smart wallet, which is available to download for free on iTunes and Google Play, was launched in May this year and has resulted in smoother traveller flow through various check-points at the airport, Almheiri said. The GDRFA assured that the application is safe and has security checks. It is very convenient as passengers don't need to carry their passport and boarding pass, because all the data registered in the system, including the name, seat number and flight number are linked to the smart wallet. 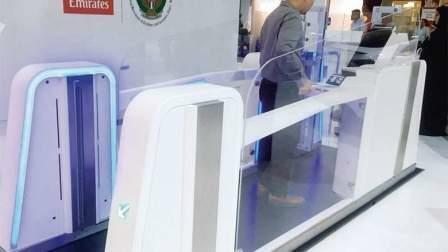 Since passengers can forego manual check by security officers at the immigration through the new smart gates, Almheiri added that the technology will also help them shift valuable manpower to focus on other responsibilities and make operations more efficient which will definitely result in improved and happier traveller experience.